On kyllä pirun vaikea katsoa ja koittaa pitää naama peruslukemilla. Kyllä pistää edelleen sanattomaksi, kun miettii, että Gerrard lähtee kauden päätteeksi. Mun mielestä tärkein juttu oli se, että kun Gerrard puhuu että jos BR olisi valmentanut kun Stevie oli 24-vuotias he muistelisivat ny mona mestaruuksia. Älyttömän korkealle siis arvostaa BR:ää ja ehkä meidän fanienkin on syytä antaa koutsillemme enemmän aikaa. Gerrard tienaisi seurassa 6 miljoonaa dollaria vuodessa. Hei nyt taas on hyvä muistaa, ett kyse on pelaajasta, jonka käyrä on selkeästi alaspäin. Tulee tuikkimaan Hall of Famessa yhtenä kirkkaimmista tähdistämme, mutta ihan oikeasti korvaamattomia henkilöitä löytyy vain haudoista. Ne ovat sellaisia, jotka eivät ymmärtäneet olevansa korvattavissa. Swansea-peli oli hyvä esimerkki, että aika aikansa kutakin. Voi kuulostaa tylyltä, mutta tällä iällä on jo oppinut siihen, että vain seura ja joukkue on ja pysyy. Ei se vähennä kunnioitusta ei arvostusta hyviin pelaajiin ja erikoisiin henkilöihin mutta ei mulle tulis mieleenkään esim ostaa paitaa jonkun pelaajan nimellä. On mulla yksi, siinä lukee Fowler, mutta se tuli aikoinaan ostetuksi ensimmäisen Anfield-käynnin kunniaksi ja muutenkin The God on erikoistapaus. Hommasin juuri lentoliput otteluun Liverpool - Crystal Palace. Sen toki tiesin jo aiemmin, että I'll be there, kun on se ottelulippu jo "taskussa". Mutta nyt on sitten siis muutkin asiat hoidossa. Linkistä videohaastatteluun LA Galaxyn kotisivuilla. 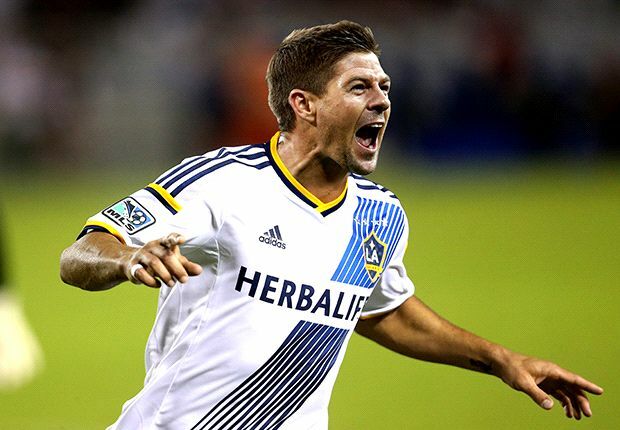 The LA Galaxy have signed English midfielder Steven Gerrard as a Designated Player, the club announced Wednesday. Gerrard is scheduled to join the Galaxy’s roster during Major League’s Soccer summer transfer window in July following Liverpool’s season in England’s Barclays Premier League, pending receipt of his P-1 visa and International Transfer Certificate (ITC). Per League and club policy, specific terms of the deal were not disclosed. Gerrard, 34, joins the Galaxy following one of the most storied careers in Liverpool and English football history. In 17 seasons with Liverpool, the team’s longest-serving captain has made 696 appearances while scoring 182 goals to date in all competitions. Gerrard also has served as captain for England, making 114 appearances and scoring 21 goals on the international level, most recently captaining his country during the 2014 FIFA World Cup. The midfielder joins the Galaxy after leading Liverpool to 10 major trophies over the past 15 years, including the UEFA Champions League (2005), UEFA Cup (2001), UEFA Super Cup (2001, 2005), FA Cup (2001, 2006), FA Community Shield (2006) and League Cup (2001, 2003, 2012). Individually, he has earned honors as the Professional Footballers’ Association (PFA) Young Player of the Year (2001), PFA Player of the Year (2006), Football Writers’ Association (FWA) Footballer of the Year (2009), PFA Fans’ Player of the Year (2001, 2009), PFA Team of the Year (2001, 2004, 2005, 2006, 2007, 2008, 2009, 2014), FA England Player of the Year (2007, 2012), UEFA Club Footballer of the Year (2005) and FIFA’s Ballon d’Or Bronze Award (2005). The Merseyside product joined the Liverpool Academy at the age of nine before signing his first professional contract with the club in 1997 as a 17 year old. He made his debut with the Reds on Nov. 29, 1998 as a second-half substitute in a match against Blackburn Rovers and went on to play in 12 more games during his debut season. His first goal came the following season during a 4-1 win at Anfield against Sheffield Wednesday. 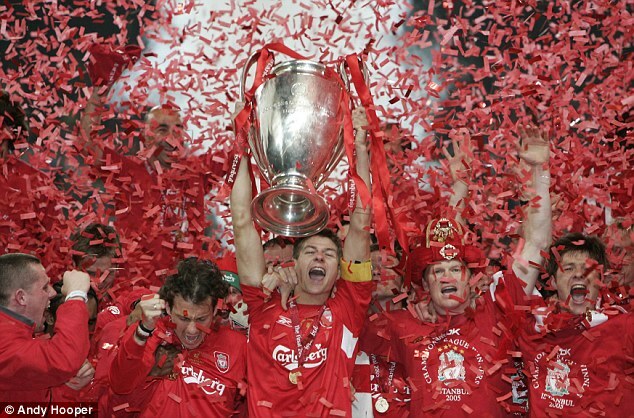 Gerrard won his first major honors with Liverpool during the 2001 season, when he helped his club capture the FA Cup, League Cup and UEFA Super Cup while making 50 appearances across all competitions. That year, he was named the PFA Young Player of the Year. After serving as a vice-captain the following year, Gerrard became Liverpool’s full-time captain in 2003, holding the title since that time. For his country, Gerrard has represented England at three FIFA World Cup competitions (2006, 2010, 2014) while serving as the team’s captain during the 2010 and 2014 FIFA World Cups. He also represented his country at the UEFA European Football Championships in 2000, 2004 and 2012. His 114 caps for England are the third most of any English international in history. The Englishman’s international debut with the England senior squad came a day after turning 20 when he appeared in a match against Ukraine at Wembley Stadium on May 31, 2000. He represented England later that year in the 2000 UEFA European Football Championship. Gerrard’s first goal for England came in 2001 when he scored the second goal of a 5-1 rout over Germany during a 2002 FIFA World Cup Qualifying match in Munich, helping England secure a spot in the 2002 FIFA World Cup. Gerrard is set to join 2014 MLS MVP Robbie Keane and 2014 MLS Defender of the Year Finalist Omar Gonzalez as Designated Players on the Galaxy roster. Tässä vielä tuo samainen haastattelu. Menee samaan sarjaan tuon ippen viimeiseksi lähettämän kuvan kanssa ennen jakamiani haastatteluja Los Angelesin suunnalta. So many people come and leave, but maybe three of them make him miss the most – and now it's his turn to be missed. Toisaalta vähän jänniä pelaajia tuolla. Tai siis miksi esimerkiksi Mascherano ja Hyypiä eivät ole mukana, tai miksi ihmeessä Craig Noone on mukana. Onko tämä se Cardiffin jamppa, joka ilmeisesti pelasi 10 vuotiaana pari kautta Poolin junnuissa. Olisi nyt ottanut vaikka Litin sinne höntsämään hemmetti soikoon... Eiköhän myös Dudek olisi tullut pelaamaan niin ei olisi Jonesia tarvinnut luukulle heittää. Onhan se tietysti ystävyysottelu, mutta ehkei nämä Jonesit, Kellyt, Shelveyt, Noonet, Babelit ja vastaavat tee oikeutta Gerrardin hienolle uralle. Gerrardin ja Carragherin joukkueiden välinen ystävyysottelu meni juuri erätuolle Carran jengin johtaessa 2-1. Balotelli ja Drogba iskivät maalit mieheen ja Gerrard sitten viimeisteli itse pilkulta joukkueensa ainokaisen. Ihan mukava fiilis katsellla peliä ja muuistella kaikkia hetkiä mitä noita pelaajia katsellessa on ollut. Alonsokin sai Anfielldilta kunnon aplodit ja ihan syystä. Ei meinannut oikein jaksaa pysyä mielenkiinto pelissä. Se näissä höntsäilyissä on ongelmana. Aika hampaattomia olivat Suarez ja Torres kuitenkin lopulta kentällä, vaikka Stevien porukka enemmän hallitsikin. Ja kun miettii muitakin nimiä. Reina ja Alonso etunenässä, niin voi että! Tulin tänne vain muistuttamaan, että Stevien aika käy vähiin. Seuraavat kaksi ottelua siis pelikiellossa, jonka jälkeen on jäljellä enää vain kuusi ottelua Valioliigaa ja mahdollisesti F.A. Cupissa vielä kaksi, jos Liverpool taistelee itsensä finaaliin asti. Kun aika käy loppuun, niin Gerrardilla tulee olemaan siis parhaimmillaan 689 ottelua Liverpoolin paidassa. Jostain katsoin, että Steviellä olisi 499 peliä kasassa (liigassa?) eli että seuraavasta napsahtaa uusi sataluku täyteen. Näinköhän höpöjä? Transfermarkt kertoo, että 497 ottelua Valioliigassa koossa tällä hetkellä. Player Focus: Was This a Season Too Far for Gerrard at Liverpool? It turns out that the biggest obstacle to Steven Gerrard fulfilling his destiny of winning the FA Cup in his final game for Liverpool on his 35th birthday was Steven Gerrard playing in the semi-final. Perhaps it was unfair to expect him to play a leading role in such a big game when he hadn’t started a match since February 10 (before Tim Sherwood was appointed manager of Aston Villa) and his only football since was 26 minutes against Swansea and 38 seconds against Manchester United. Perhaps it’s unfair even to single him out for blame when so many Liverpool players fell below what was expected of them in the semi-final – according to WhoScored.com’s ratings, Gerrard was Liverpool’s second-best player at Wembley – but it’s inevitable when the build-up to a game has so centred on one player that, for good or ill, the focus should fall on that player. Gerrard began the game as one of two attacking central midfielders in a 3-4-2-1, then the central creator in a 4-2-3-1 as Brendan Rodgers changed formation midway through the first half. 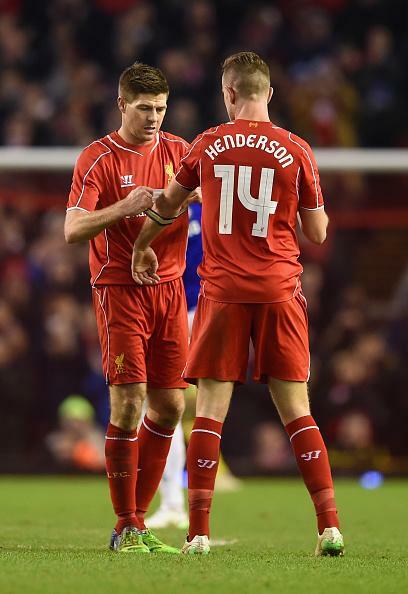 By the start of the second, as Rodgers made another switch, he was at the base of the midfield in a 4-3-3. His short passing was decent – a completion rate of 82%. He even managed two key passes and three shots. The ghost of the footballer he was still lingers, and yet he never exerted the authority he once would have done. This was not the Gerrard who could grab a game and turn it to his will; often the game seemed to be going on around him, as when Fabian Delph ran away from him in the build-up to Aston Villa’s second goal. Twice in the final 10 minutes he had chances that once, would have had you off your feet in expectation, but here his free-kick was deflected tamely into the arms of Shay Given and his looping header from a Philippe Coutinho corner dropped too soon and was cleared by Kieran Richardson. Perhaps the hardest thing in sport is knowing when to say goodbye. Gerrard has given a lifetime to Liverpool, has known nothing but playing football for them. He doesn’t want to get to LA Galaxy and find that the fires burn as bright as ever and that he might have had a part to play in a Liverpool title challenge. It must be hard, whatever profession you’re in, to accept that the ability that has given you your standing is diminishing. You want to squeeze every drop from that talent, yet you don’t want to become a liability. There must always be a tendency to denial, to assume that you had one bad game rather than that that game was indicative of a long-term decline. Gerrard’s figures, though, are stark. His pass success rates are much as they have been throughout his career, even if shots per game are down. But he’s making far fewer tackles and interceptions than in previous seasons – an indication, perhaps, that his sharpness has gone, that he’s not quite getting close enough to opponents to stop them. He is dribbling far less than in previous years: ageing legs won’t allow him to make those driving runs he once did. Average passes per game, crosses and through-balls are down on the past two seasons, something that can’t only be attributable to his changing position. Very few players manage their exits well, and even those who do are often dogged by the thought that they could have gone on longer – in Paul Scholes’s case to the extent of actually coming out of retirement. Given how last season went, given how close Liverpool were to glory, given how well he personally played, given even the desire to put right what went wrong with his slip against Chelsea, it’s understandable Gerrard would carry on this season but it has perhaps been a year too far – at least for him to be a regular starter. Perhaps that is best reflected in his WhoScored.com rating: this is the first year in which he will average under 7. 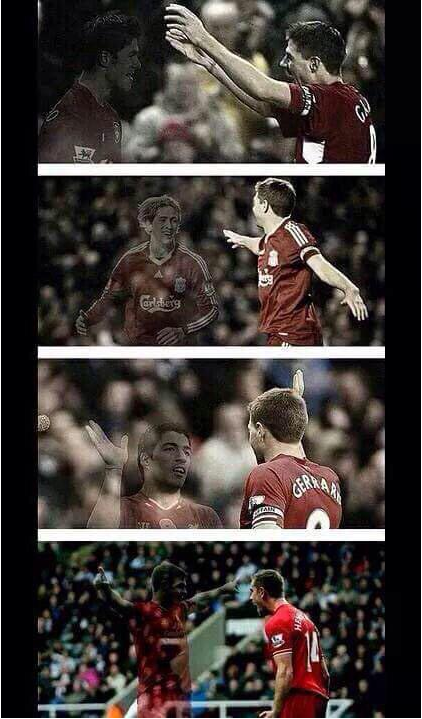 For Gerrard, time has run out. Stevie jotenkin luiskahti viime kauden lopussa ulos formusta. Paska juttu. Edit. Ei onnistu videon upotus twitteristä, tai jos onnistuu en osaa. Harmi kun noita twiittejä ei forumilla saa näkyviin. Osaisiko modet sanoa, olisiko asia jotenkin muutettavissa? Oli vain yksi hieno video Premier Leaguen virallisilla twitter tilille Gerrardin 500. pelin kunniaksi. Mutta ei saa näkyviin tässä/ en osaa. Perkele. En tiedä onko tätä parempaa tapaa. Retweettien ja suosikkinappulan jälkeen on se kolme pistettä ja siitä vaan "Copy link to the Tweet." Tämän viikon lauantai-ilta ja ensi viikon sunnuntai-iltapäivä ovat hetkiä, joita monet Liverpool-kannattajat ympäri maailmaa ovat pelänneet. On aika heittää hyvästit. Erityisesti tulevaan lauantai-iltaan kohdistuu melkoinen odotus, kun Steven Gerrard astelee viimeisen kerran pelaamaan Liverpoolin paidassa Anfieldin nurmelle. Tähän väliin kerrottaneen, että Telegraphin Chris Bascomben mukaan Liverpool ja Crystal Palace aikovat tehdä ”Guard of Honourin” Gerrardille ottelun alussa ja ottelun jälkeen lienee tiedossa Gerrardin puhe Anfieldin yleisölle. Tänään muuten Gerrard pitää vielä itse tiedotustilaisuuden (muistaakseni Suomen aikaa klo 15) ennen viimeistä kotiottelua. Itselle henkilökohtaisesti Steven Gerrard on ollut ja on edelleen paras keskikenttäpelaaja. Zidanen lasken hyökkääjäksi tässä tapauksessa, mutta jos hänet laskisi kk-pelaajaksi, niin aika lailla samoilla viivoilla mentäisiin. Metri kasikolme –senttinen, Merseysiden Whistonista maailmalle ponnahtanut Stevie G on noussut todellisten Pool-legendojen joukkoon, mutta myös maailman kaikkien aikojen pelaajien joukkoon. Tämän kauden aikana toki taso on laskenut, mutta esim. vielä viime kaudella Gerrard oli iso syy siihen, että Pool pääsi kevään aikana hirvittävään lentoon, joka kantoi melkein mestaruuteen asti. Harmittavasti vain yksi liukastuminen ja Palace-ottelun tunarointi maksoi sen mestaruuden, joka jää Gerrardilta nyt puuttumaan. Gerrardia on voinut jossain määrin kuvailla jopa täydelliseksi pelaajaksi. Maailmanluokan laukaukset, keskitykset ja syötöt. Kukaan ei unohda niitä kuuluisia 40-50 metrin puolenvaihtoja, joita Gerrard on vielä Poolin viimeisinäkin kausina pudotellut millintarkasti kanssapelaajille. Ennen kaikkea Gerrard on ollut liideri ja kapteeni, Captain Fantastic. Niin monen monta kertaa kippari on sytyttänyt joukkueen ja liidannut joukkueen voittoon tai jopa mestaruuteen. Istanbul 2005 ei unohdu koskaan. Gerrard sytytti joukkueen, teki 1-3 kavennuksen ja loppu on historiaa. Jopa pudotuspeleihin pääsy oli vaakalaudella joulukuussa 2004, mutta esiin astui Gerrard, joka tykitti pallon vastustamattomasti maaliin ja takasi näin paikan pudotuspeleihin. Edelleen tulee kylmät väreet, kun katselee videon pätkää, jossa Andy Gray huutaa kurkku suorana. Jälleen hetkiä, jotka ei ikinä unohdu. FA Cupin finaali 2006 on myös oma lukunsa. Kaksi maalia varsinaisella peliajalla, joista jälkimmäinen oli 3-3 tasoitus aivan ottelun viimeisillä hetkillä huikealla kaukolaukauksella, joka onkin yksi Gerrardin uran kohokohdista. Vaikka Valioliigan voitto jää Stevieltä uupumaan, on hänen palkintorecordinsa silti huikeaa luettavaa. Kaikkein kirkkaimpana tietysti Istanbul 2005, joka ei unohdu koskaan. Tämän lisäksi taskussa on FA Cupin voitto (2), Liigacupin voitto (3), Community Shield, Uefa Cup ja Uefa Super Cup (2). Henkilökohtaisia palkintoja on lisäksi kymmeniä, joihin kuuluvat esim. valinta Uefan vuoden pelaajaksi 2005. Englannin maajoukkueessa Gerrardille kertyi kunnioitettavat 114 ottelua, jolla hän on sijalla 3 maajoukkuepelien määrien tilastossa Shiltonin ja Beckhamin takana. Näissä otteluissa Gerrard viimeisteli 21 osumaa. Gerrard sai kunnian olla myös MJ-uransa pari viime vuotta kapteenina. Poolin paidassa Gerrard aloitti akatemiassa jo vuonna 1987 eli seitsemän vuoden ikäisenä. Akatemiassa Gerrard pelasi vuoteen 1998 ennen kuin hän pääsi debytoimaan edustuksen riveissä 29.11.1998 Blackburnia vastaan. Tähän päivään mennessä Gerrard on pelannut kolmanneksi eniten pelejä Pool-paidassa, kokonaissaldon näyttäessä 708 ja liigaotteluiden saldon 502. Pool-uran ensimmäisen maali syntyi Shelffield Wednesdayn verkkoon 5.12.1999 upean yksilösuorituksen päätteeksi. Jälkeenpäin sanottua tyypillinen Gerrardin maali, joita on nähty vuosien saatossa suuri määrä. Maalitilastossa Gerrard on sijalla 5. 185 täysosumalla. Liigamaaleja puolestaan on syntynyt tähän mennessä 119. On olemassa hetkiä, jotka itse tulen aina muistamaan, kun puhutaan Steven Gerrardista. Istanbulin ihme ja FA Cupin finaali 2006 tulivatkin jo mainittua. Lista olisi todella pitkä, jos hetkiä alkaisi kunnolla listaamaan. Lukuisat kiihkeät ottelut Evertonia ja Manchester Unitedia vastaan ovat olleet jotain aivan erityisiä, joihin Gerrard on ollut vaikuttamassa isolla tavalla. Kiihko on mennyt ajoittain jopa yli ja Gerrardille on näytetty useasti punaista korttiakin, mutta vastapainoksi Gerrard on liidannut joukkuetta isolla sydämmellä ja ratkaissuit näitä isoja otteluita. Kaudella 2008-2009 Gerrard oli hurjassa vireessä. Siltä kaudelta muistettaneen ainakin legendaarinen tuuletus Old Traffordilla sekä huikea dominointi mm. Real Madridia vastaan. Gerrard tulee jättämään valtavan tyhjiön joukkueeseen kesällä hänen suunnatessaan Los Angelesiin ja Galaxyn riveihin. Pelillisesti Gerrard voidaan kyllä korvata (tarpeeksi laadukkaalla pelimiehellä), mutta kukaan, ei kukaan voi korvata häntä johtajana ja liiderinä. Siitä tuleekin valtava haaste seurajohdolle ja Rodgersille (tai kuka ikinä managerina onkaan), että mistä saadaan kasvatettua uusi liideri tälle seuralle. Henderson on vahvin ehdokas uudeksi Pool-kippariksi, mutta hänelläkin on vielä valovuosi matkaa Gerrardin johtamistaitoihin ja joukkueen sytyttämiseen. Nyt kun vielä lähitulevaisuuden aikana Pool on menettänyt tärkeitä johtavia pelaajia, niin nyt jos koskaan on nykyisillä roster-pelaajilla mahdollisuus nousta valokeilaan. Hienoa olisi, jos Poolin omasta akatemiasta nousisi uusi "omankylänpoika", josta kehittyisi johtava pelaaja, kapteeni ja ennen kaikkea liideri Merseysiden punaisille. Nuorelle Jordan Rossiterille on tätä viittaa akatemiassa soviteltu, mutta on liian aikaista puhua edes siitä, että kasvaako nuorukaisesta edes ykkösjoukkueen pelaaja. Flanagan olisi myös hienoa nähdä johtavana pelaajana, mutta hänen uransa on vaakalaudalla vakavan polvivamman takia. Tulee olemaan älyttömän vaikeaa miettiä Liverpoolia ilman Gerrardia. Tuntuu jopa, että joukkueen sydän ja sielu poistuu Gerrardin mukana. Vielä tälläkin kaudella on jälleen ollut otteluita, joissa Poolin pelaamista on puuttunut kunnon tekemisen meininki. Gerrard on useimmiten kuitenkin saanut joukkueen syttymään joko pelkälllä läsnäolollaan tai maaleillaan/syötöillään jne. Gerrard on ottanut joukkueensa reppuselkään monen monta kertaa. Miten ihmeessä joukkue ja seura selviytyy tästä eteenpäin ilman todellista johtajaansa? Itselleni oli aikanaan kova paikka, kun mm. herrat Hyypiä, Torres, Reina ja Carragher jättivät joukkueen, mutta Gerrardin lähtö tulee olemaan vieläkin kovempi paikka. Oma suuri idolini jättää suosikkiseurani. Pelaaja, jota on jo pikkupoikana matkittu pihapeleissä ja jonka tuuletuksia on pyritty kopioimaan pihapelien tuoksinnassa. Noloa tai ei, mutta väkisin tulee tippa linssiin (jopa tätä tekstiä kirjoittaessa). Vanhemmille Pool-kannattajille, jotka ovat nähneet Dalglishin, Rushin, Fowlerin etc., tämä ei ole välttämättä niin "maailmanlopunjuttu", mutta uskon, että varmasti jokaista Pool-kannattajaa ympäri maailmaan Gerrardin lähtö raapaisee. Gerrardin jättäessä Liverpoolin toivon, että pelinumeroa 8 ei nähdä kenenkään muun selässä. Mitään numeron jäädytystä tuskin tapahtuu, mutta se voisi olla jäissä siihen asti, kunnes Pool-paidassa pelaa uusi joukkueen liideri, mieluiten jopa oma kasvatti. Siihen voi tietty mennä toki aikaa.